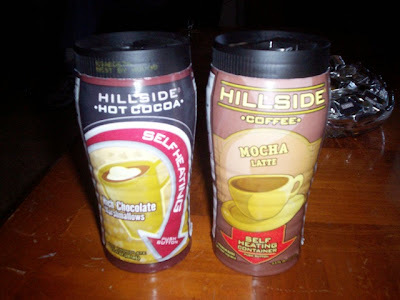 Mom and I have been seeing these Hillside self-heating coffees and cocoas at Wal*Mart for a few months now. Originally the price was $2 each, but Mom didn't want to spend $4 on two drinks that we weren't sure were any good. So, we left them there. Yesterday, we saw them on sale for $1 each. "Can we get them now," I asked, impatiently. "Grab two," said Mom. I chose the cocoa with marshmallows while she chose the mocha latte coffee. The other flavors we saw were French vanilla latte and cocoa without marshmallows. We had no idea how the beverages were to heat themselves, and were anxious to find out what they tasted like. THE VERDICT: Delicious! Mom's coffee was thick, rich, and had a strong mocha flavor. You could see the marshmallows floating around in my cocoa, which was creamy and chocolaty. Both Mom and I were fascinated by how the whole thing worked. We still don't understand how the cup heated itself. Maybe we need Mr. Wizard for this one. When you first open the bottom, you have to press a button which releases green water into the cup. Green water? "What kind of poison is this," said Mom. After releasing the green water, we turned our cups over and were told to wait 5-8 minutes, or until a pink dot on the label turned white. Odd. When it turned white, we had to turn the top of the cup (which my father is convinced has been locked down so that the cup doesn't explode) until we're able to see the top of the can. Pop the top, and enjoy! We certainly did.